The Prime Minister claimed that some Pakistani officials and ex-prime minister Manmohan Singh met a day before Mani Shankar Aiyar made the 'neech' jibe against him at Aiyar's residence. PALANPUR: Prime Minister Narendra Modi today suggested Pakistan was trying to influence the Assembly elections in Gujarat, claiming some Pakistani officials and ex-prime minister Manmohan Singh met a day before Mani Shankar Aiyar made the "neech" jibe against him. In a new twist to the vitriol-filled campaign, Modi said the meeting took place at Aiyar's residence. He also raised questions about the alleged appeal by former director general (DG) of the Pakistan Army Sardar Arshad Rafiq for making senior Congress leader Ahmed Patel the chief minister of Gujarat. "There were media reports yesterday about a meeting at Mani Shankar Aiyar's house. It was attended by Pakistan's high commissioner, Pakistan's former foreign minister, India's former vice president and former prime minister Manmohan Singh," Modi told an election rally at Palanpur. The meeting at Aiyar's house continued for almost three hours, Modi said, adding "the next day, Mani Shankar Aiyar said Modi is 'neech' (a vile man). This is a serious matter." "(On one hand) Pakistan Army's former DG is interfering in Gujarat's election, on the other, Pakistani people are holding a meeting at Mani Shankar Aiyar's house. After that meeting, people of Gujarat, backward communities, poor people and Modi were insulted. Don't you think such events raise doubts," Modi asked. Congress spokesman Randeep Surjewala, however, rubbished Modi's claim, terming it as "baseless". "Holding the country's topmost post, Modiji is making baseless allegations. Modiji is worried, dejected, angry. Such a statement has no truth or fact, and is based on lies. Such a behaviour is unbecoming of a prime minister," Surjewala told reporters in Ahmedabad. Though Modi did not name the ex-vice president present at the meeting, BJP president Amit Shah said in Ahmedabad that it was Hamid Ansari. Shah told reporters that the Congress leaders had not informed the ministry of external affairs or the Indian government about the meeting. Modi also accused the Congress of creating a "rift" between various communities and spreading the "poison of casteism" in society for power. 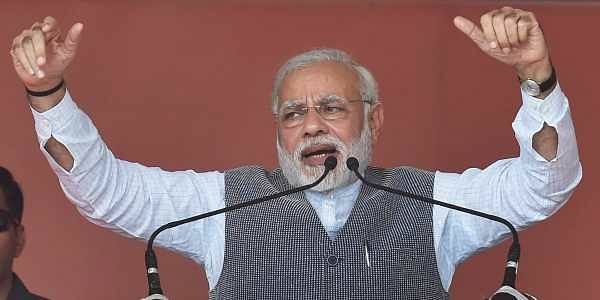 The prime minister, who did not speak much due to sore throat at the Palanpur rally, slammed the Congress for spreading a false propaganda that the Modi government worked only for the rich. Modi cited the case of Genabhai Patel, a progressive farmer from Banaskantha district who was recently conferred with 'Padma Shri', to claim his government's pro-poor credentials. "Just compare those who received Padma Shri, Padma Bhushan and Padma Vibhushan during the 10 year rule of the Congress with those who were given the same awards in my three-year tenure (as PM so far). That comparison would tell you who was pro-rich and who is pro-poor," he said. "Do you know who received that award (Padma Shri) from Banaskantha? That was our Genabhai. Is he rich or is he a mill owner? Does he have an aeroplane?..This shows who is working for the poor," Modi said. He said the entire north Gujarat region, particularly Palanpur, would witness "unbelievable growth" over the next five years due to the Delhi-Mumbai Freight Corridor. Later, while addressing a rally in Kaalol town, Modi accused the Congress of sowing seeds of enmity between various communities for power. "It seems that Congress just doesn't want to improve. They still believe in acquiring power by creating enmity between two communities and by creating a rift between brothers. They spread poison of casteism in the society to retain power in the past," the prime minister said. Referring to Congress leader Arjun Modhwadia's claim that the EVMs used for the first phase of polling on December 9 might have been tampered with, Modi said the party was "preparing excuses" to insulate Rahul Gandhi against impending defeat. "On December 18 (the day of counting), party leaders will claim on television that Congress lost because of (Mani Shankar) Aiyar's comment. They won't say that party lost because of Rahul. There is an agenda in the Congress- 'Save Rahul, Save Family'," he said. During the first phase of Gujarat elections yesterday, Modhwadia, the party candidate for Porbandar seat, alleged that his cell phone was getting connected to an EVM through bluetooth, a claim the Election Commission said was incorrect. Modi seized on Modhwadia's claim to attack the Congress. "To be on the safer side, they have prepared one more excuse. Yesterday, when the polling was on, some leaders claimed that (one) EVM was connected with bluetooth. They should have used common sense. EVMs are not online devices and can never be connected with bluetooth," he said.